Brightly colored 13'x13'x13' moonwalk. Classic entertainment at an affordable price. 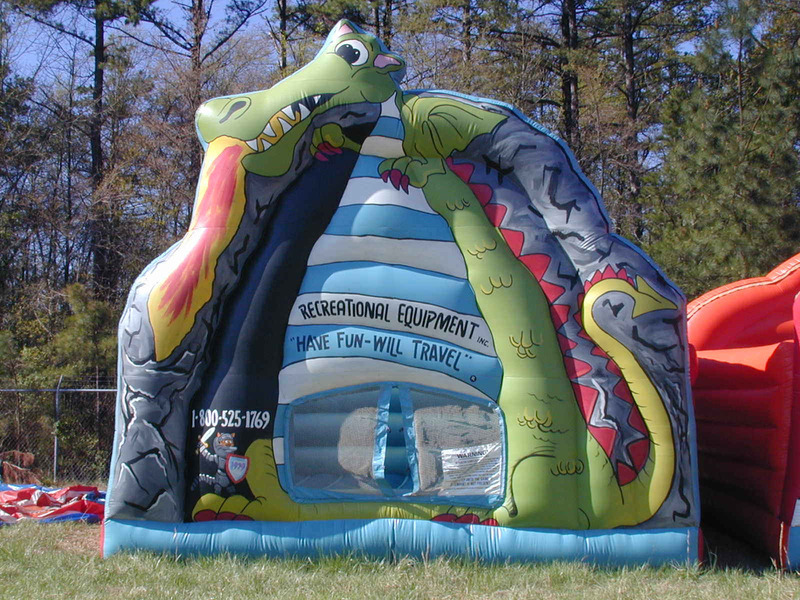 By far our most popular and versatile inflatable attraction. 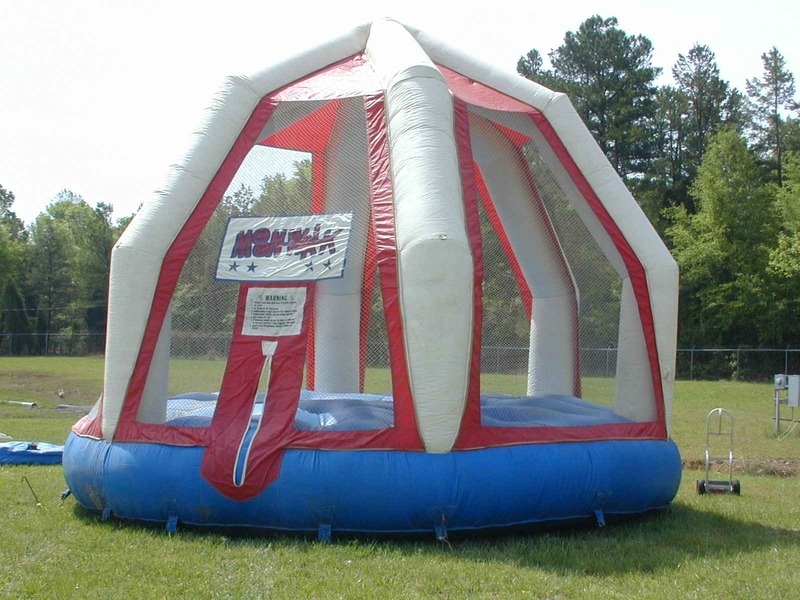 With its red, white, and blue color scheme and its Apollo capsule shape, these bounces BLAST!!! into fun for one and all! Holds between 6-10 children at a time. 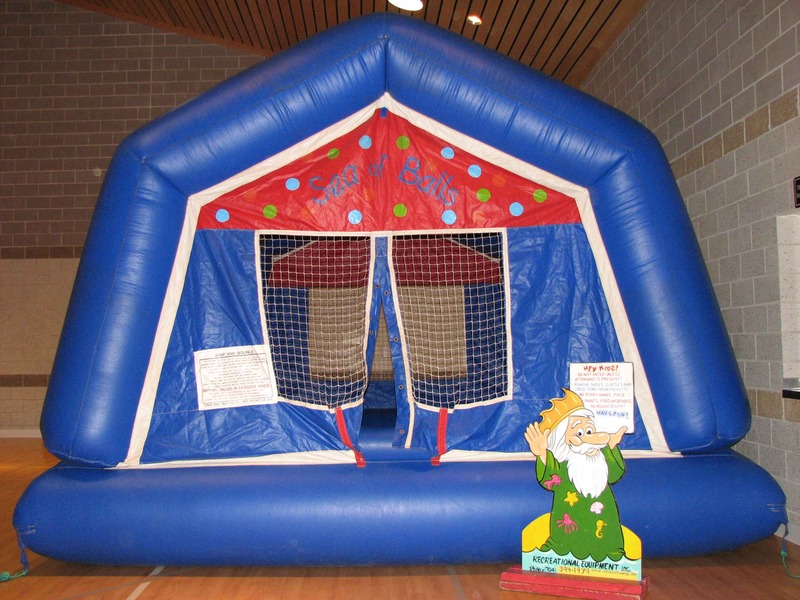 Ever popular bouncing fun, complete with a happy clown face, sure to provide hours of imaginative fun. 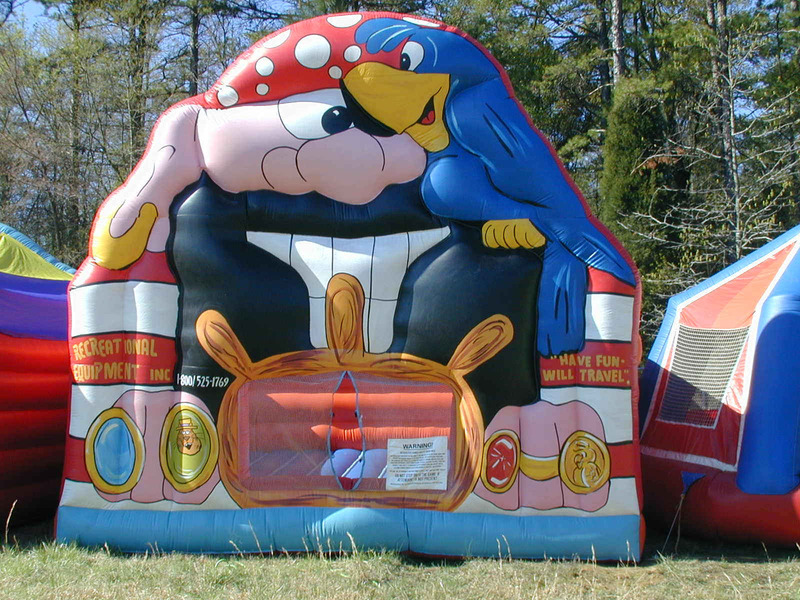 Attractive red, white, and blue color scheme makes this inflatable Bounce ideal for celebrations, festivals, holidays, birthdays, and more! 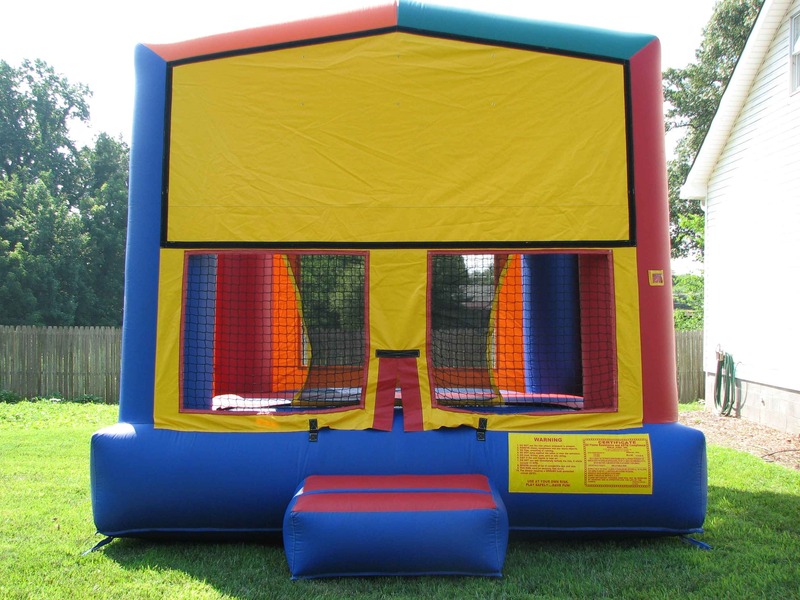 This bounce has an open top and is great for indoor height-restricted spaces (unit requires only 11 feet). 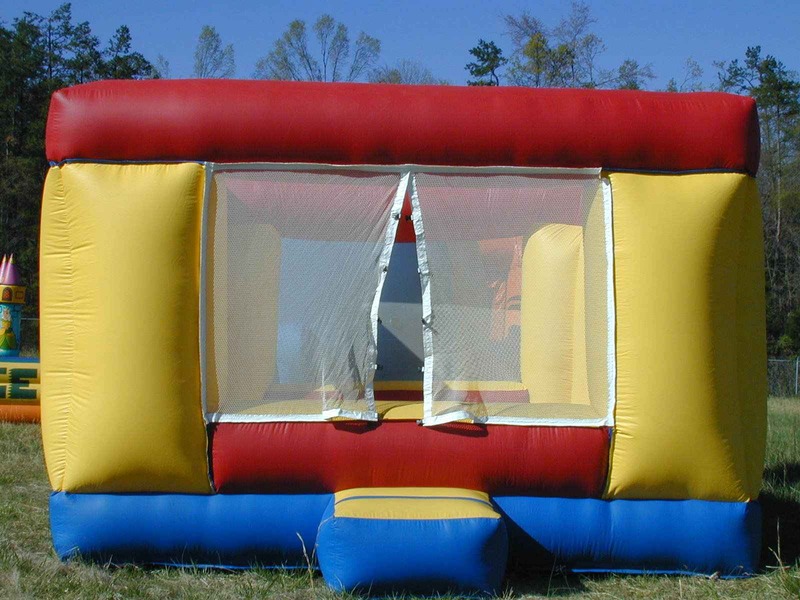 These bounces hold up to 10-15 children at a time. With fully enclosed top and netted sides, these units have superior visibility and sunscreen protection. 800 pound capacity. For added height attraction, this unit stands 24' tall with netted sides. Support columns resemble octopus tentacles. Open air fun at its finest! Holds 12-14 people at a time. 600 pound weight limit. 40' long, 31' wide, and 24' tall. 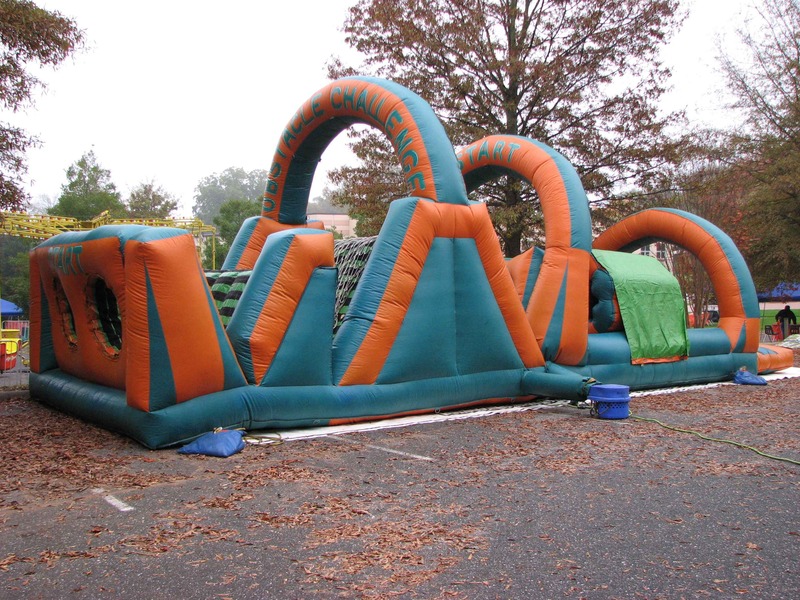 Dual-sided race, composed of 8 separate obstacles, including climbs, slides, squeezes, crawl through's, pop-up blocks, a 10' tall climbing wall, and the 25 foot long slide. Wild entertainment for up to SIX players! Air hose hockey incorporates elements of air hockey, foosball, and inflatable dynamics. Team members use air hoses to direct a foam-rubber ball toward opponents' goal. 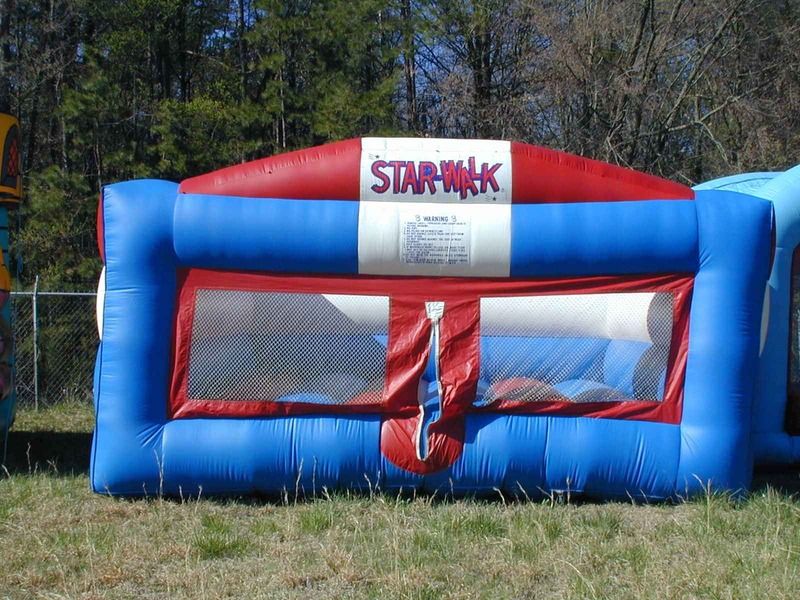 Novel addition to any over-the-top party. Fun for all ages. Great for team building and more! 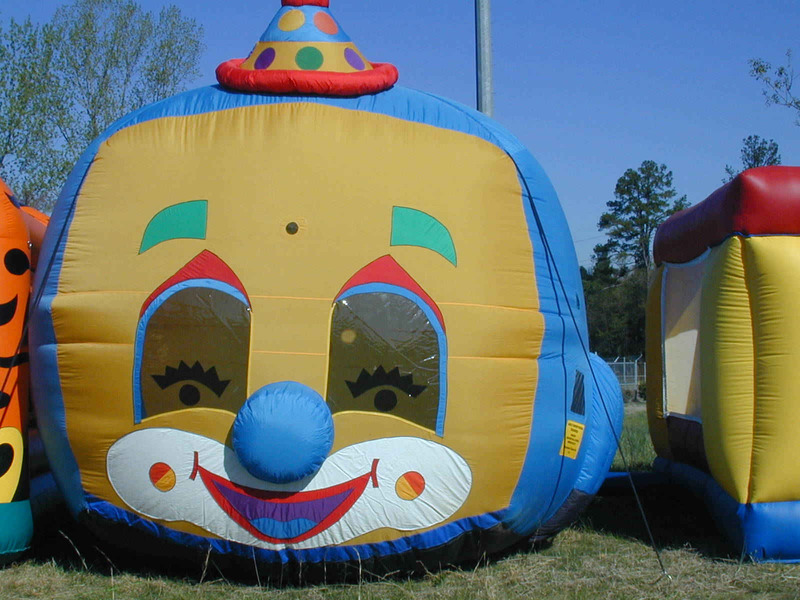 Step inside the inflated play area. Children are thrilled by the moving balloons gently swirling above their heads. Suspended rings add challenging element of interaction. Kids attempt to direct balloons into 3 hoops suspended above their heads. Great item for preschoolers. The colorful clown-theme keeps things bright and festive! Size up your opponent in the ring! 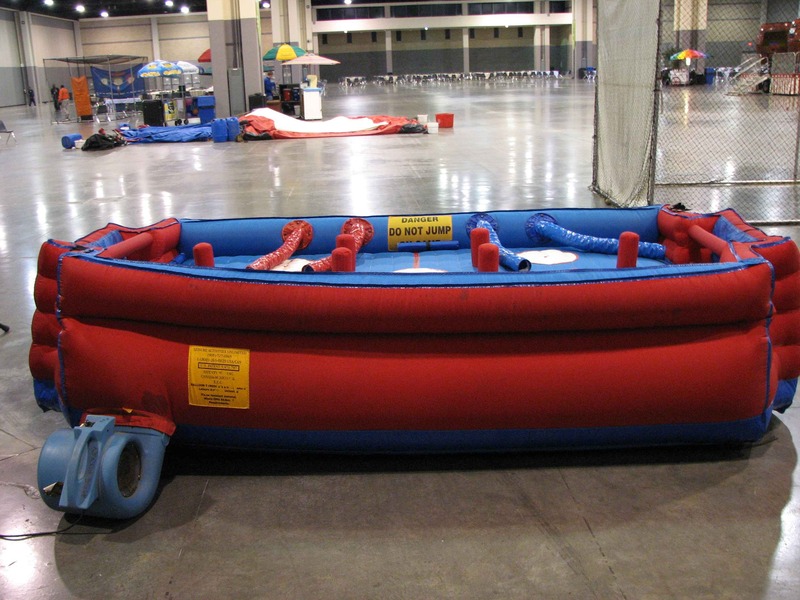 "Boxers" use oversized boxing gloves to take on their challenger in this inflatable arena. Fun to participate or to watch! Ahoy, matey, climb aboard me pirate ship and explore. Complete with slide, climb, and play area. Wonderful graphics take you to sea. Don't get left behind! Race in our two-lane inflatable! 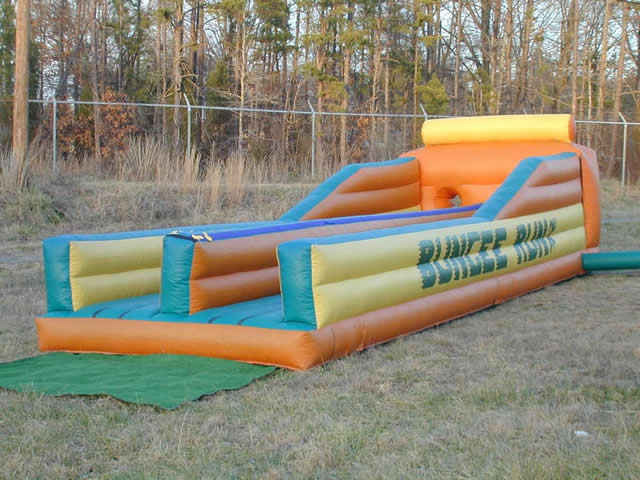 Out-distance your opponent and mark your spot before your bungee cord pulls you back in your lane. 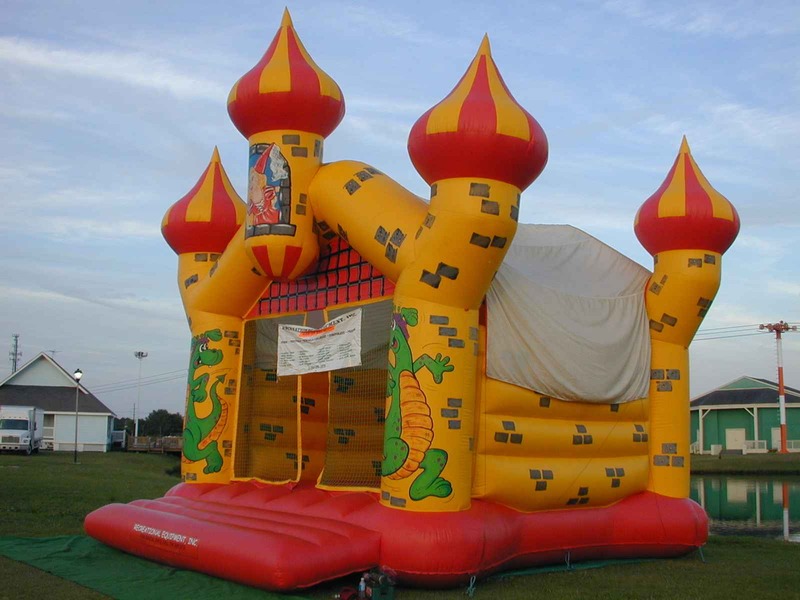 Multi-sided inflatable moonwalk with six towers! Its brilliant paint scheme attracts boys and girls alike to imagine days of old. Let the good times roll. This playthrough adventure includes 55 feet of fun animals and 2 slides. Happy Clown mural in front that is 18' tall and 20' wide. 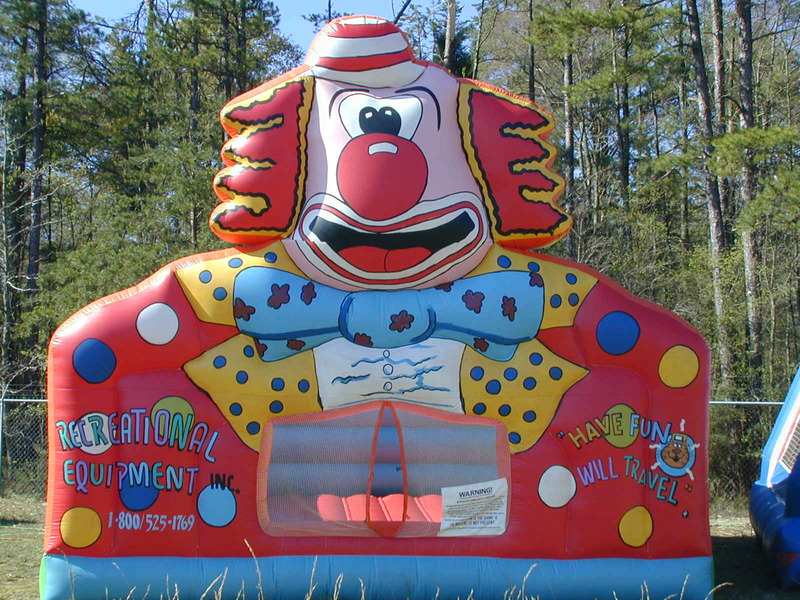 Perfect accent piece for any carnival, fair, birthday, or circus-style event. From nose to tail, this adorable pup has all the fun you could ever need. Magic Dragon mural on the front that is 18' tall and 20' wide. A must for any dragon or dinosaur party. Accommodates between 12-15 children at a time. 23' long, 23' wide, and 26' tall. Fabulous 3-D towers, along with wonderful artwork make this castle a fantasy to behold. Can hold up to 18 children. 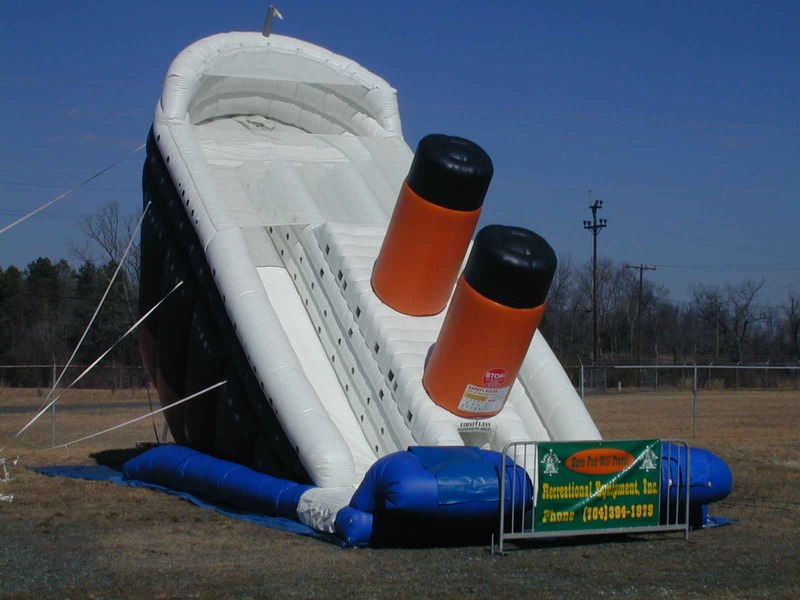 This combination moonwalk and slide adds new dimension to any event. 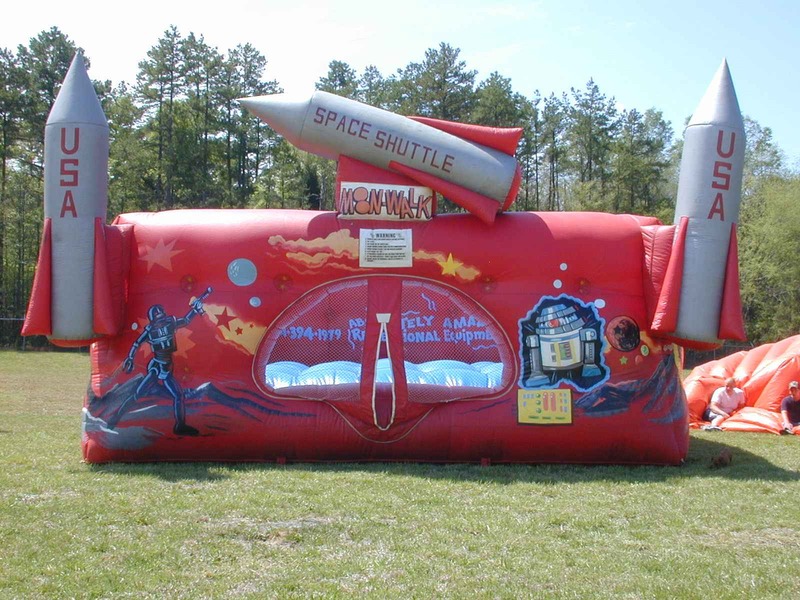 Rapidly gaining popularity with fairs, festivals and corporate events. Get two units for the price of one! Brightly painted graphics will add to any event. Great for ages 12 and under. Take the ultimate test in strength and balance! 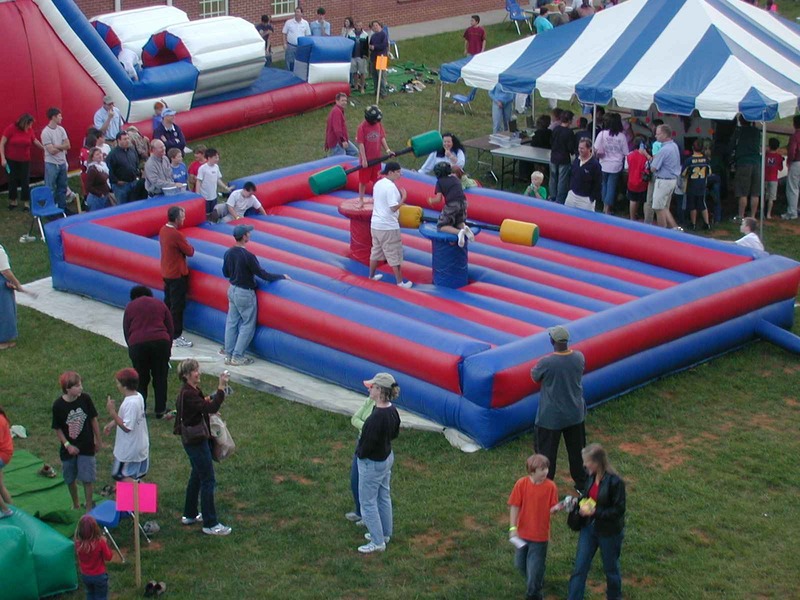 Two competitors stand on the raised pedestals and use large padded jousting poles to dethrone their opponent. 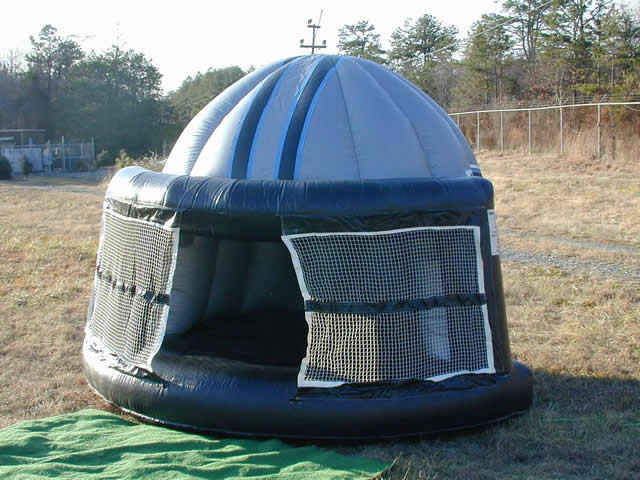 Inflated arena provides safety. As much fun to watch as it is to participate. Take the challenge for fun! Popular for schools, churches, corporate events, and festivals! 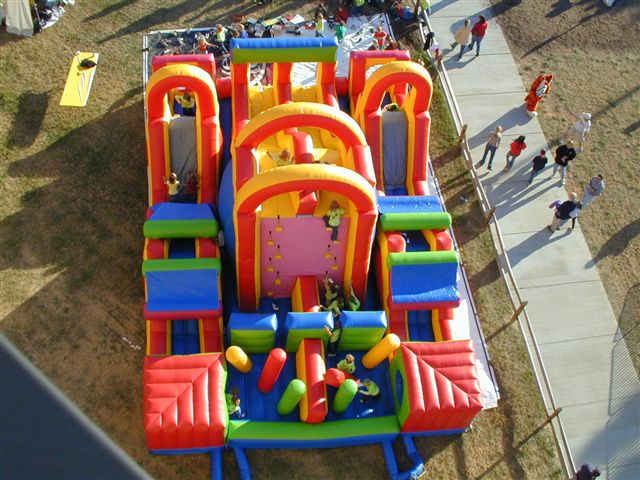 An obstacle course for children under 100 pounds. Gorilligan's bright colors and 14'-high presence will thrill and delight all that see him! New double air-lock entrance adds greater capacity and less deflation. Slide at end prevents children from re-entering ride (when they're out, they're out). Better visibility with central viewing areas. 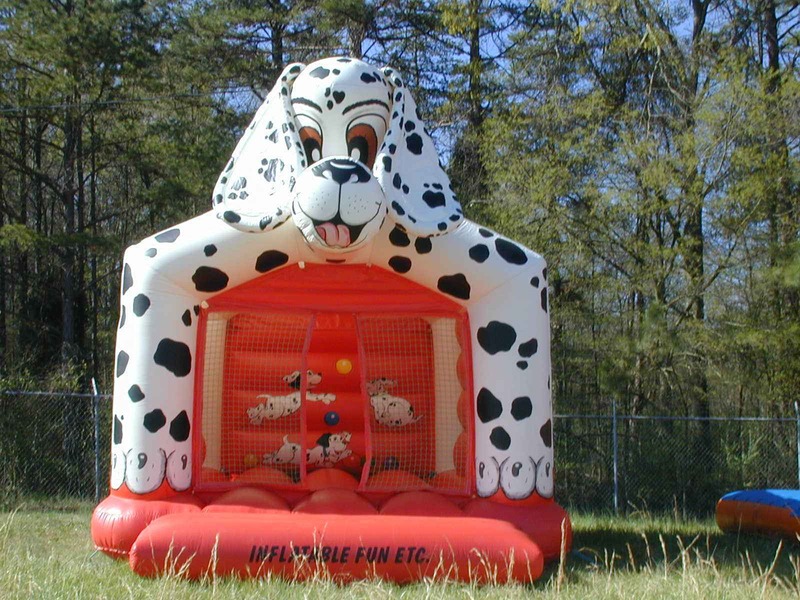 Our larger inflatable ball unit filled with over 6000 colorful balls. Wonderful compliment to any of your indoor/outdoor events. Great for preschool ages. 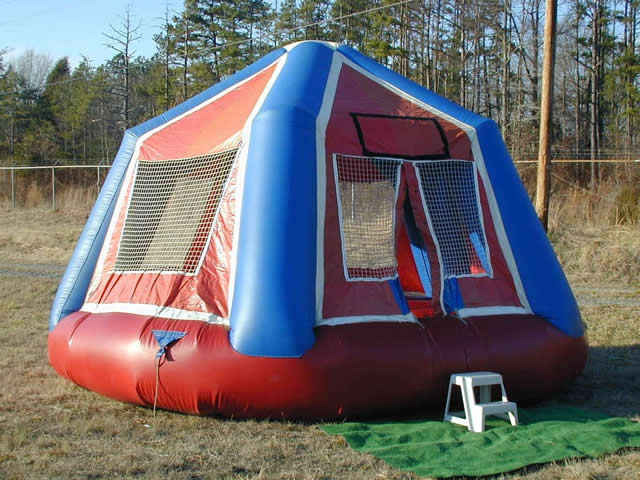 Has netted windows & a 10 inch inflatable floor. Smaller unit available. Sparks hours of imaginative fun! 3-2-1 Blastoff! Large open top moonwalk with three large three-dimensional rockets. This unit makes an impression! 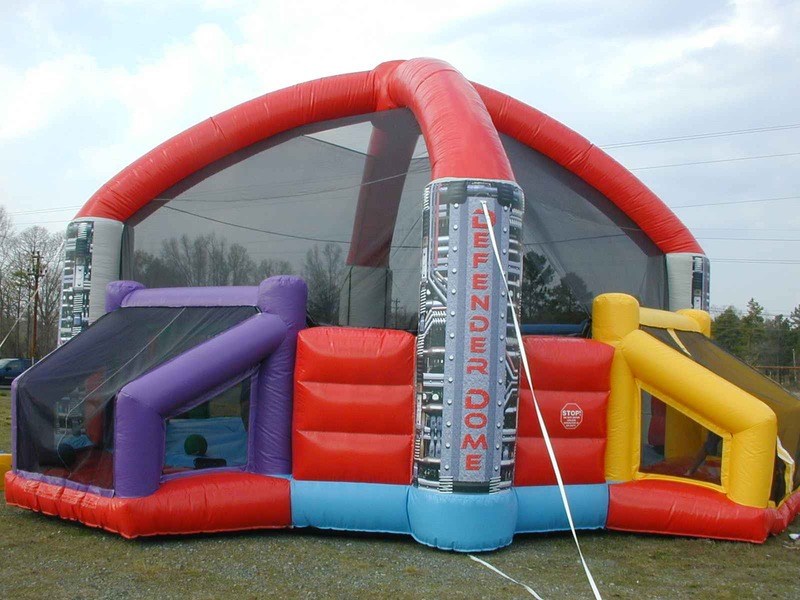 One bounce for kids, one giant leap for FUN! Great for all ages. 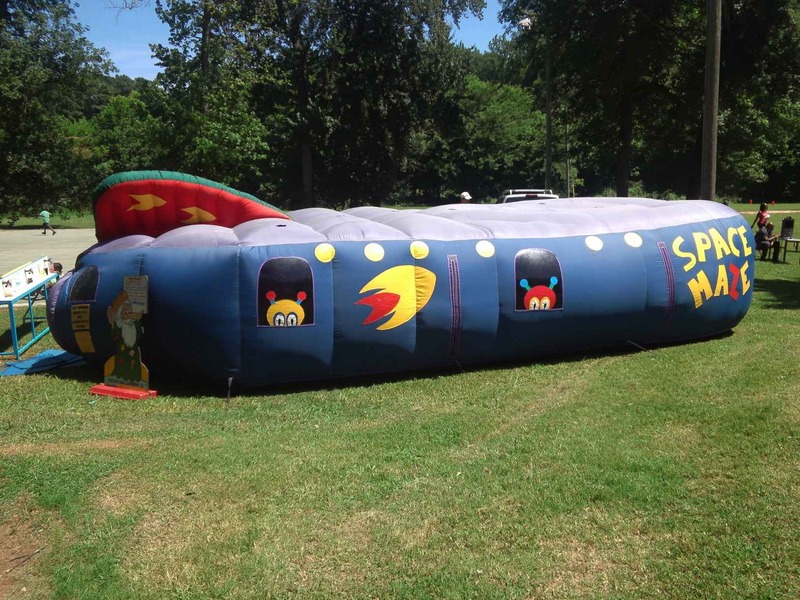 Experience the speed of our largest inflatable slide! Climb a rope ladder to the top, then get your adrenaline pumping as you slide 35 feet to the bottom! We recommend children under 4 years of age be accompanied by an adult. A real eye catcher! 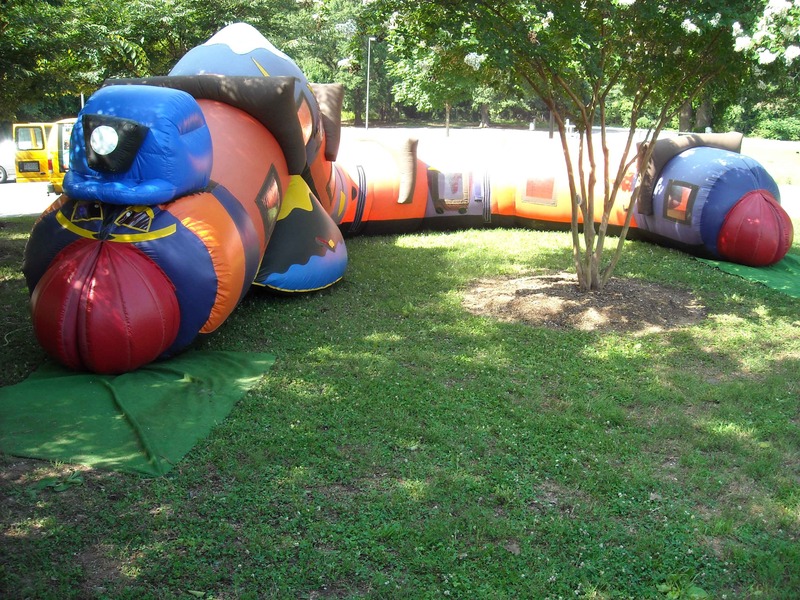 Huge 55' long inflatable caterpillar is an obstacle course for children under 100 pounds. 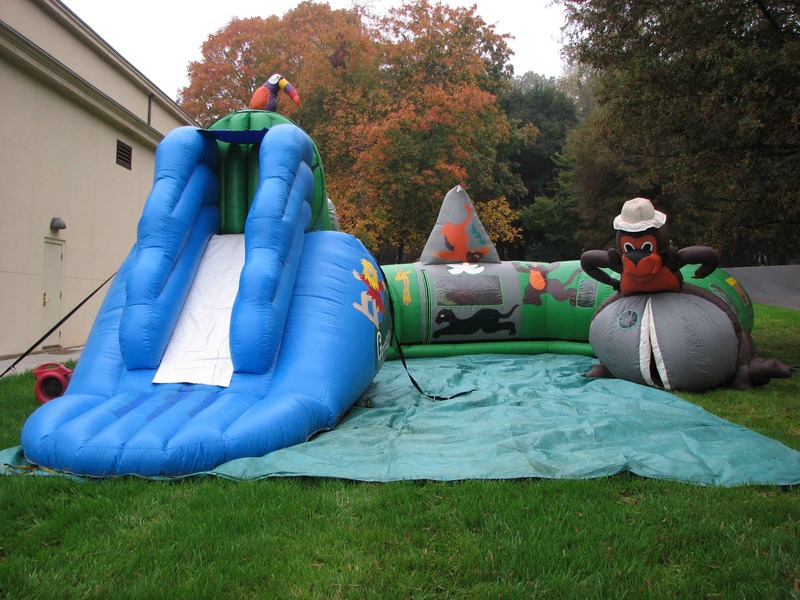 Kids will climb, slide and crawl their way to the fun beyond! Themed as an 1870's Goldrush Miner. 20' long, 20' wide, and 30' tall. 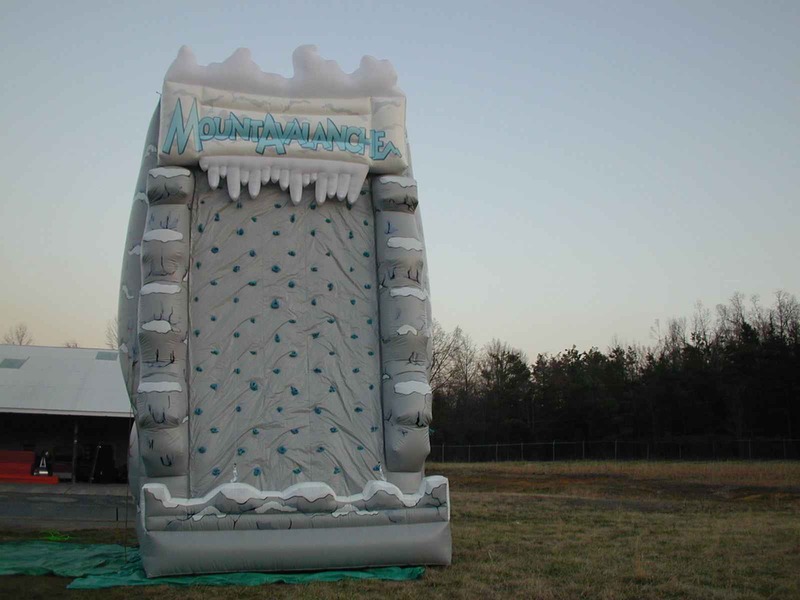 Snow-capped mountain peak climbing wall with 2 separate stations equipped with auto-belay descenders for the thrill of climbing a giant ice wall. Not to worry, descenders prevent any falls, bringing you safely back to Earth. Big fun for small fans! Giant replica of an official NFL Panthers football helmet. Designed for ages 3 and under. 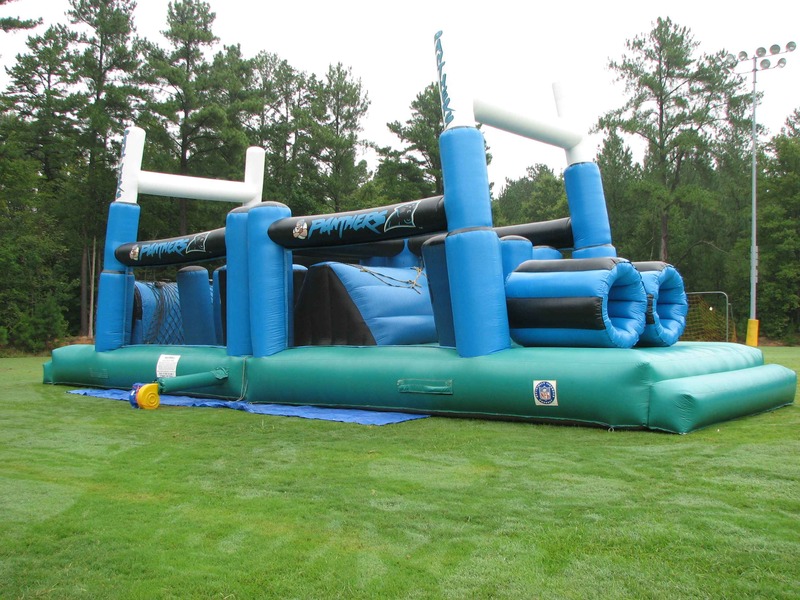 Make the winning touchdown as you race through this official NFL-licensed Carolina Panthers obstacle course. Rush, block, and tackle your way through the obstacles to beat your opponent and come away victorious as you cross the goal line first! 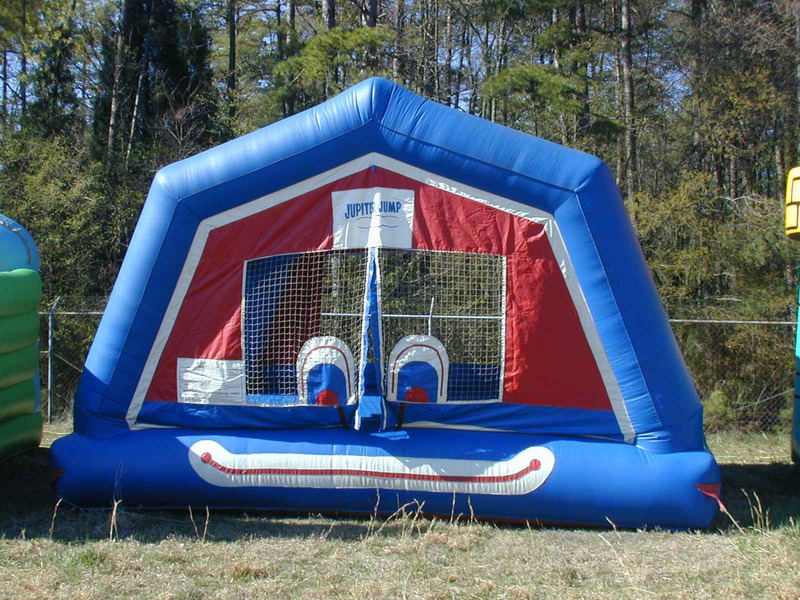 Great for large events, schools, team building experiences and more! Able to accommodate over 200 people per hour. 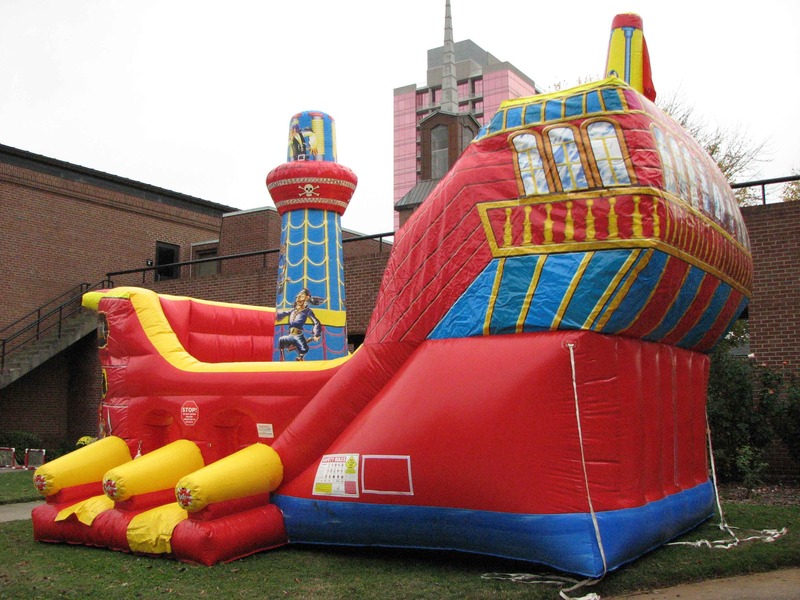 With dual lanes, this ship appeals to the high seas adventure awaiting you in the waves below from it's 28 foot height. 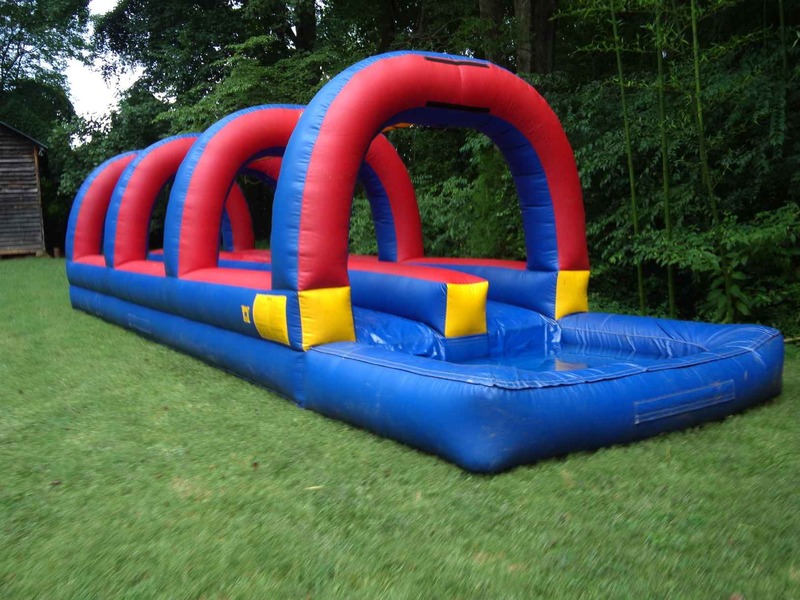 Test your skills: run, jump, climb, slide in our large inflatable obstacle course. Great for ages 5 and up! Accommodates up to 200 people per hour. 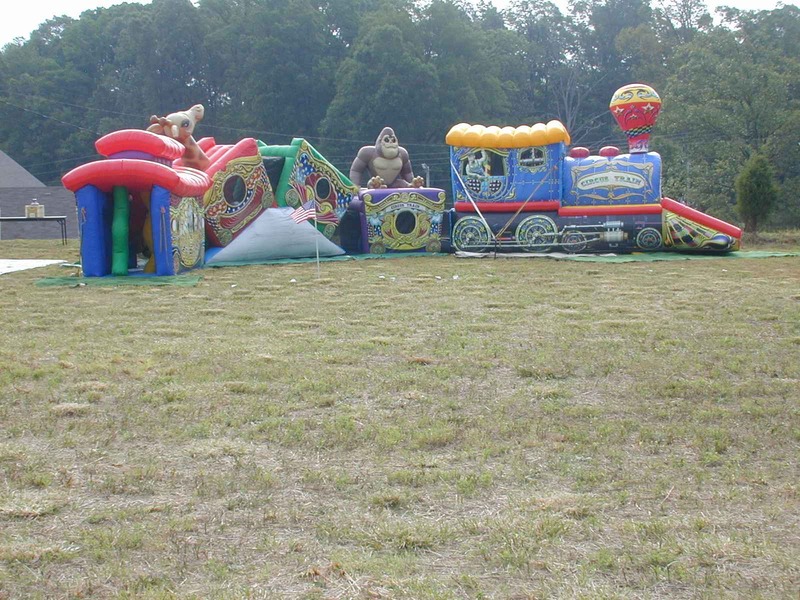 Provides hours of fun for large and small events. One of the more popular rental items available. Its universal appeal to competition also makes it stand out as a proven money maker for pay-to-play events. Game offers you a safe and intense tug and pull towards opposing goals or endzones. 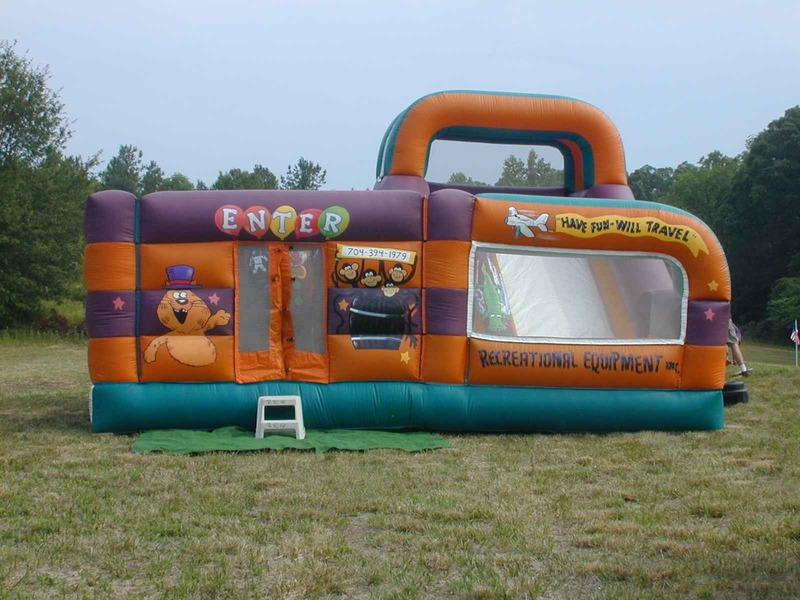 Event goers will have a blast harnessed to opposite ends of a single bungee cord that runs through an inflated 4-foot wide column. Either football or basketball themed. 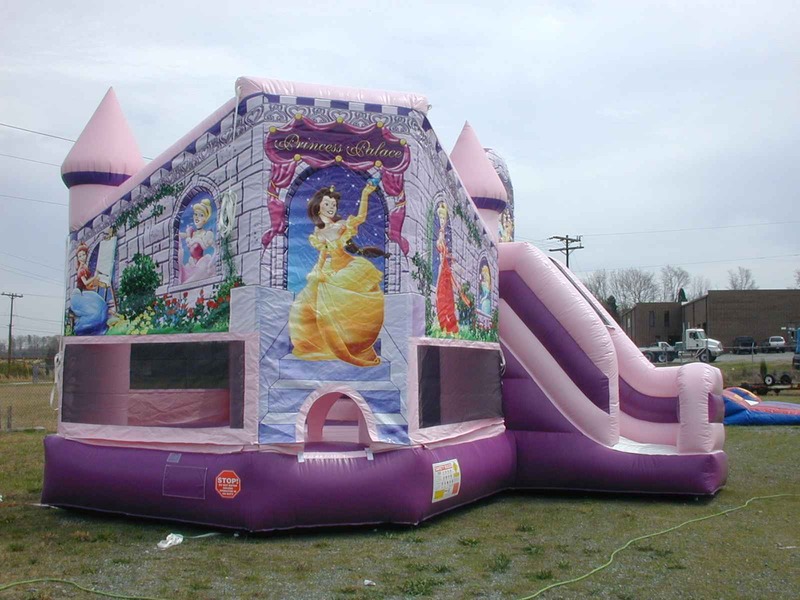 Popular fun-filled fantasy land ideal for our younger princesses! 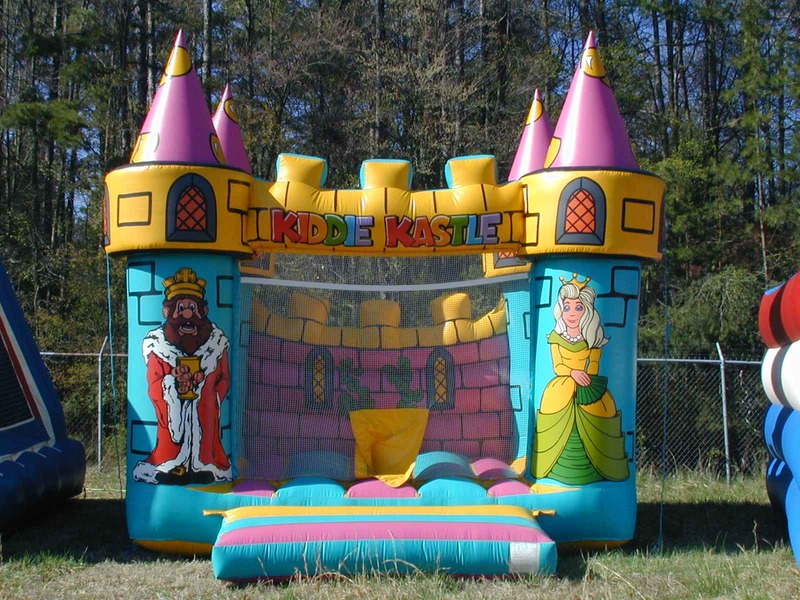 Decorated with a Princess and Knight colorful pastel theme. 20' long, 20' wide, 19' tall. 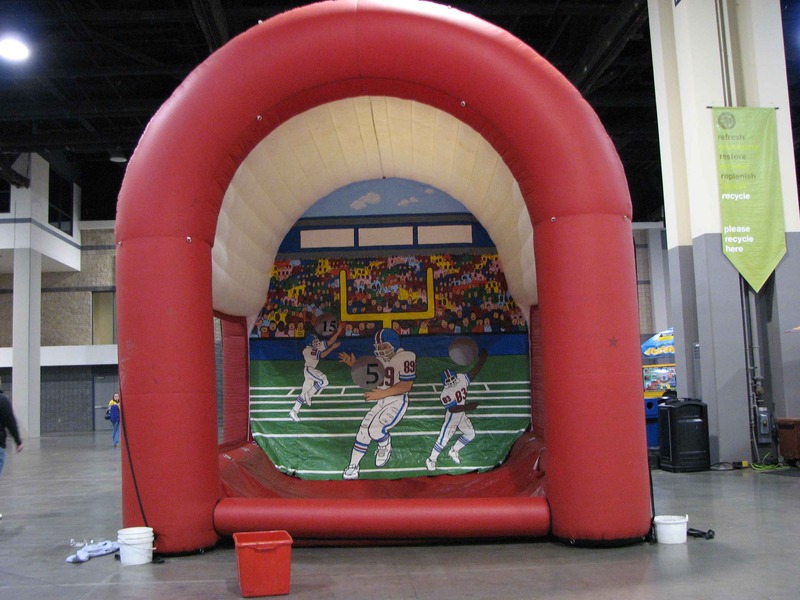 Brightly colored inflatable with graphic scoring background, ball return, and regulation footballs. Scoring and accuracy combine for unlimited entertainment for all ages. Fun filled activity for all ages. 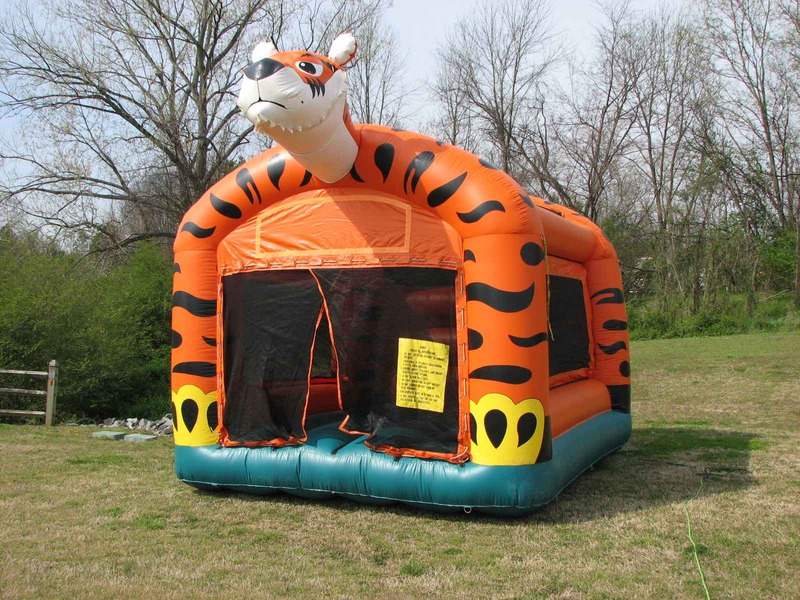 This two-lane inflatable is 35' long with a full 200 gallon pool at the end for increased safety. The misting system built into the overhead tube allows participants unparalleled "slippage". 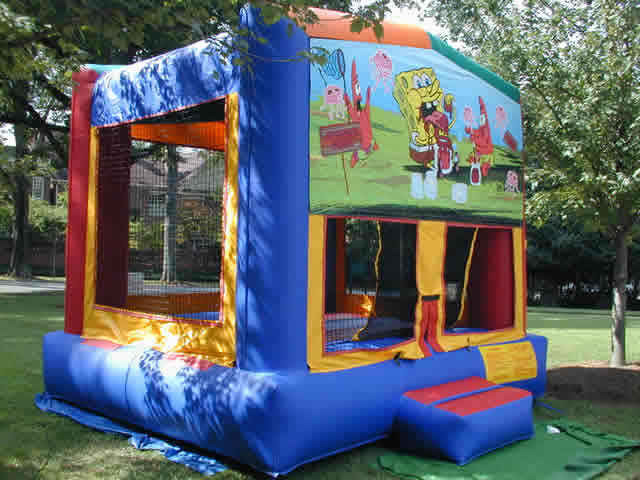 A must have for any spring or summer outdoor event. Colorfully themed inflatable filled with nearly 5000 balls. Ideal for Pre-K ages. Has netted windows and an inflated floor. Larger unit available. Balls fly as imagination abounds! Hours of imaginative fun! Your favorite character incorporated into a moonwalk. 13'x13'x13'. 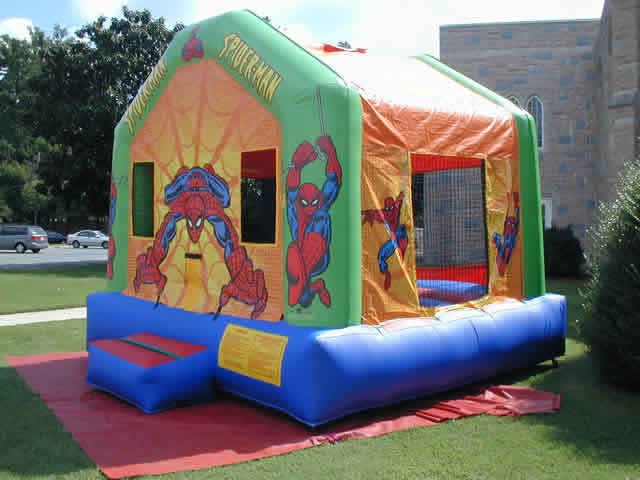 Great for themed events, birthday parties, etc. Up to eight people can compete at a time. Shaped like a giant purple oval alien spaceship kids will have hours of enjoyment playing hide and seek or peek a boo thru the smoked vinyl windows. Add to the fun by using the laser vest upgrade option (additional fee). Wearing laser receptors and laser shooters, use this maze to outwit your competitors. For the true enthusiast, fog machines can be added for an additional fee. 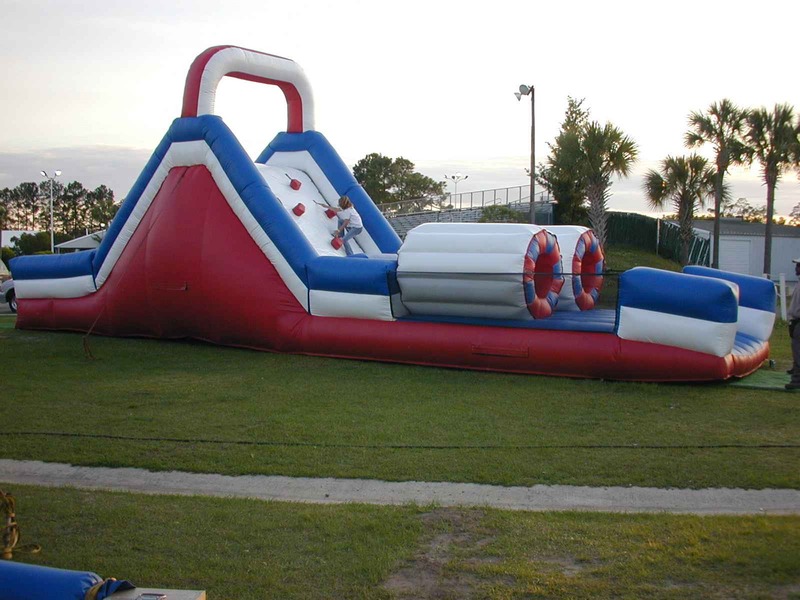 Our tallest inflatable slide! This 40-foot tall multi-colored, circus-themed slide is a screamer! As much fun going up as sliding down you climb up a winding rope ladder through a tunnel and then slide down the corresponding spiral slide. 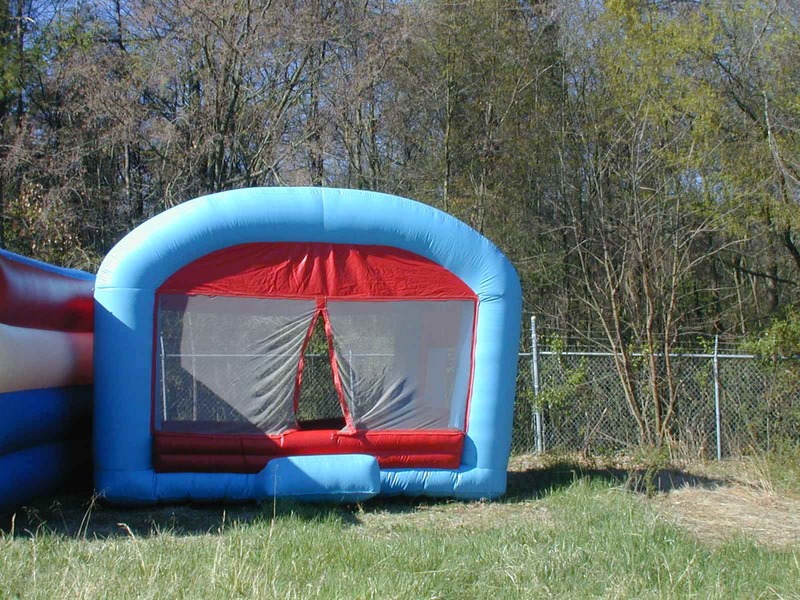 The safety-enclosed slide is covered by sun-shade mesh for those hot days. Your favorite character incorporated into a moonwalk. 13'x13'x13. 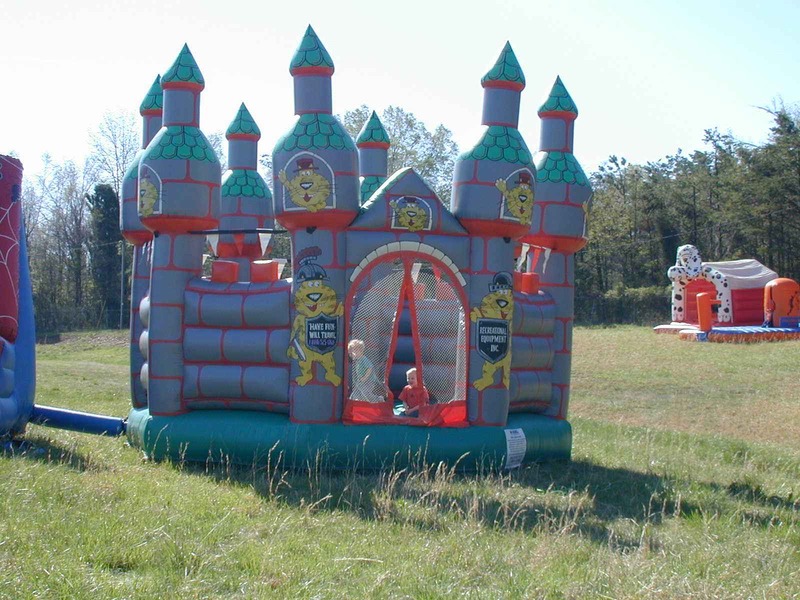 Great for themed events, birthday parties, etc. Brightly themed tiger that stands 18' tall and has hours of imaginative jungle fun. Pay attention! The big one is upon you! It's big, It's bad, and the tsunami wave is gonna thrill. 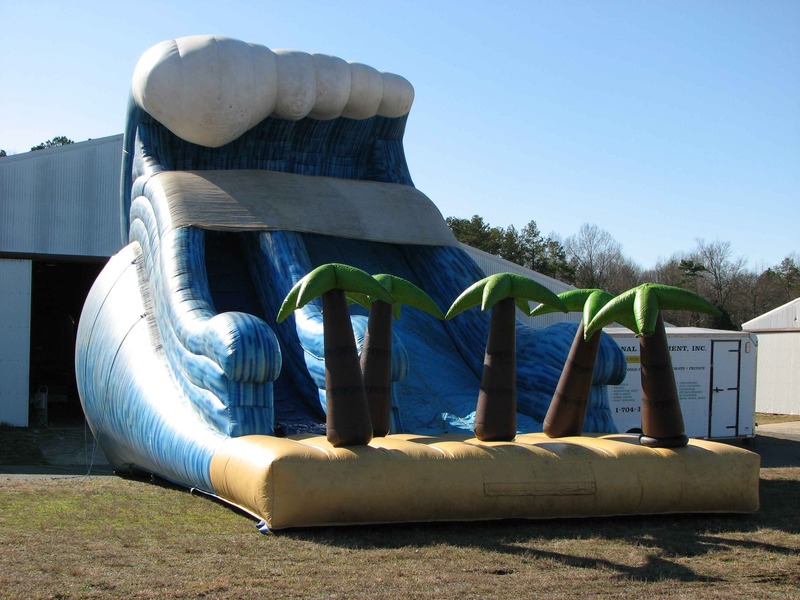 At nearly 33' tall, this giant wave of excitement gives hours of endless fun. Riders climb to the crest, then descend to the palm tree lined beach. 45' long , 35' wide and 36' tall. 70' long, 14' wide, and 22' tall. 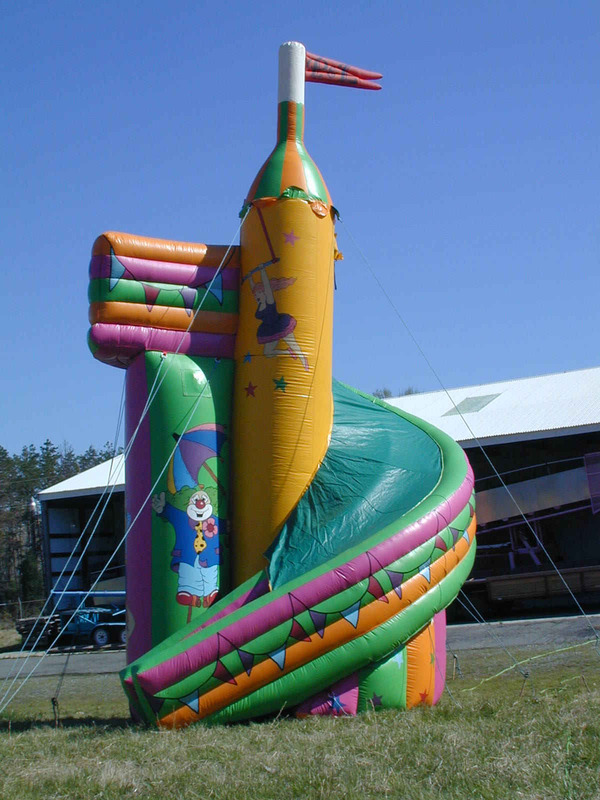 Fun-filled competition for 2 participants through inflated tubes, climbing up to the peak and sliding down to victory. Human fly paper! 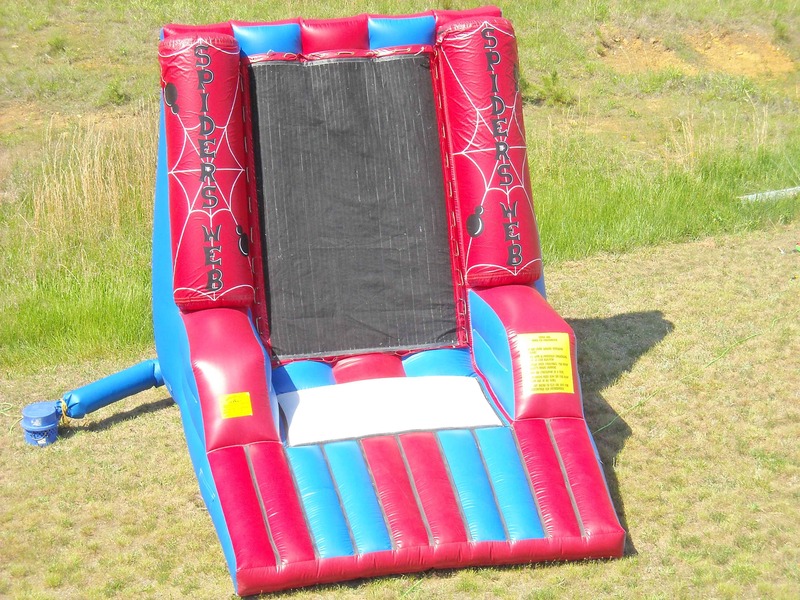 Experience the vertical high of our 14' velcro wall. 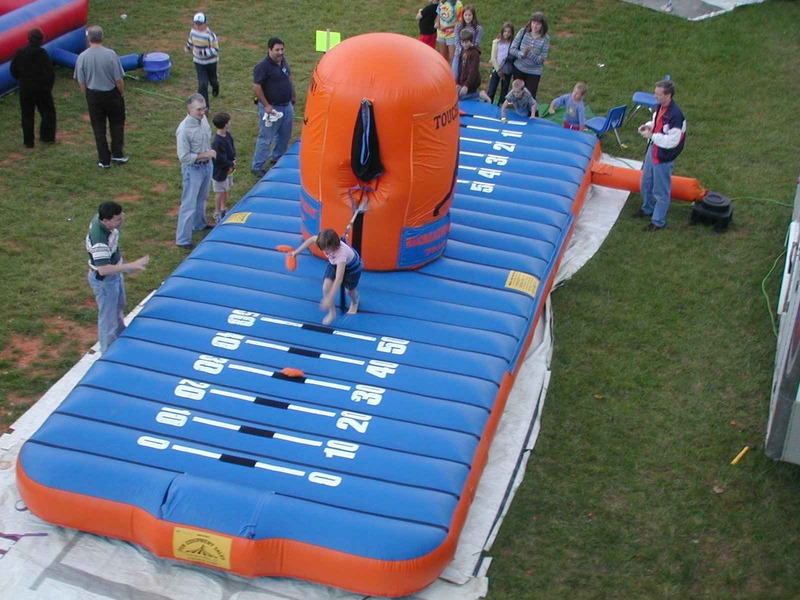 Player puts on a velcro suit and attempts to bounce and ""stick"" to the velcro wall. Great for spectators and participants alike! 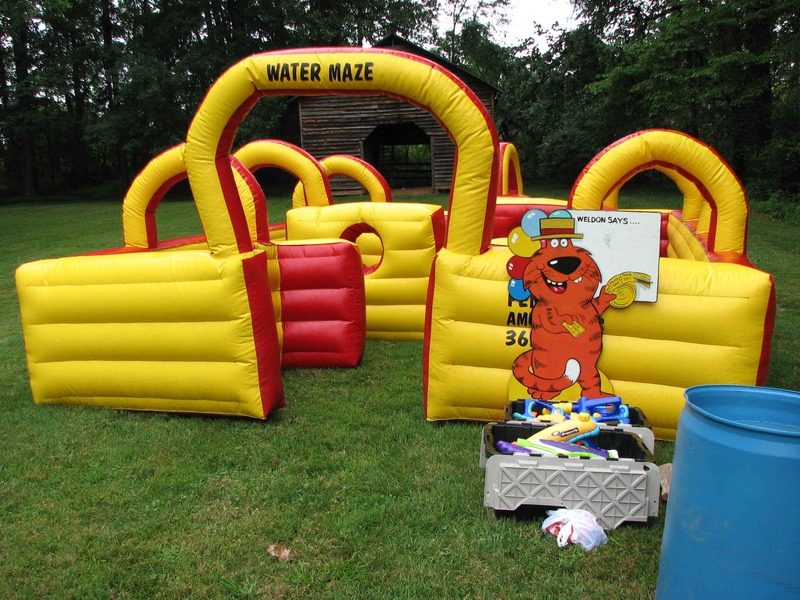 Imagine the excitement of Laser Tag, the mystery of hide-and-seek, and a good old fashioned water fight and BAM!!! you've got the Water Tag Maze. Participants run throughout this open-top maze while wearing special vests with indicator floats. When your float indicates "FULL," you're out. Use Super Soakers to "soak" each other. Game can be played on a timed or last-person-standing format. 20' long, 12' wide, 16' tall. 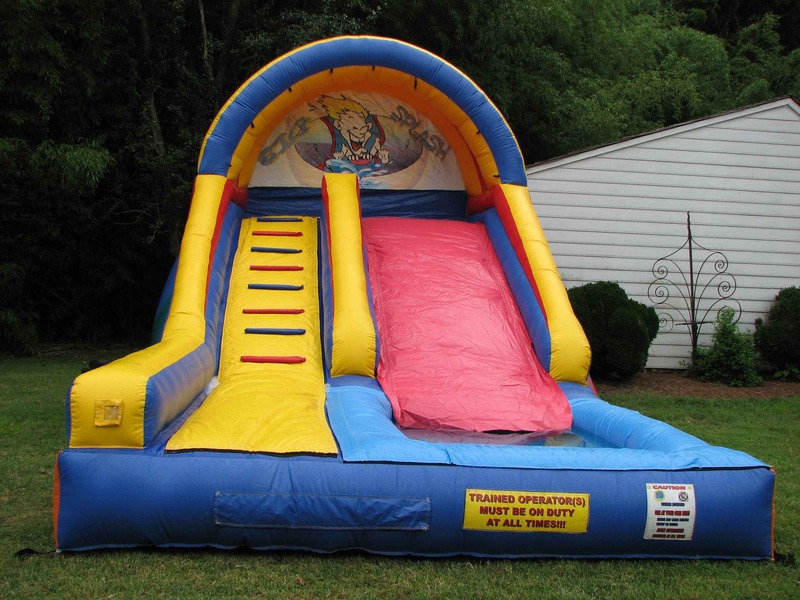 Slippery fun for those hot days with a slide and a pool at the bottom. Wet and wild time for all. What goes better than climbing to the top and sliding to the bottom ...Sliding to the bottom when it's filled with refreshing cold water. The pool takes about 200 gallons to fill up. Misting system ensures that riders have a free slipping good time. Adult supervision is recommended for all non-swimmers.